As a mother of a child with autism, Nat McKay understands very well the frustration parents feel when trying to find answers and support after the initial diagnosis. When her son JT was diagnosed with the disorder at the age of three, support was fragmented at best. No one could really answer basic questions about what next steps to take with her child. What do they do as he gets older? Can he go to school? She knew that education was key to her son’s success and the same applied to other children just like him. At the time there were limited education opportunities in the state to integrate children with autism into the same schools with other children their age. And there was little or no job training available to them. Soon after her son’s diagnosis, Nat attended an Autism Society of America conference to learn more about how to help her son at home and how to work with his teachers at school. Also, at the conference she learned how other states and universities were serving those affected by autism. She considers this conference a turning point for her, and was inspired to build systematic supports across Kentucky for those affected by autism. In 1994, Nat and another parent of a child with autism decided it was time to advocate for change in Kentucky and open doors of opportunity for children with autism and related disorders. They learned everything they could about the legislative process in the state, how bills were passed and who they should talk to about getting a bill to pass. She stated that the experience was eye-opening is respect to how some people reacted to the disorder and the children who had been diagnosed with it. Their goal was to establish a center that served as a resource for families and educators of children with autism throughout the state. In 1996, the state passed a bill to establish the Kentucky Autism Training Center (KATC) that would be housed at the University of Louisville’s College of Education and Human Development. The Kentucky Autism Training Center provides hands-on training for educators to help them in the classroom, and promotes the academic success of students with autism. KATC hosts workshops for families and conducts professional development sessions for education professionals across the Commonwealth. The KATC also provides referral information for families, caregivers and educators who work with children with autism and related disorders. The center has made great strides in increasing autism awareness around the state and through teacher training has enabled children with autism to attend school in many districts. The center also provides an online Kentucky Autism Supports and Services Directory which is searchable by regions, county, service, and age. Parents, teachers, and other caregivers can find services and contact information in their area through this database. KATC’s Amanda L. King Resource Center contains a collection of materials about autism spectrum disorders, family issues, special education, and employment issues. The materials are available for checkout to families and professionals across the state of Kentucky and the library’s resources are growing every year. The Amanda L. King Resource Center is the only source of autism, special education, and vocational information available to all citizens of Kentucky. In addition, the KATC holds the largest and most current collection of autism related information in the state. KATC is currently leading a team of families and professionals around the state to develop the Kentucky Family Guide for Autism Spectrum Disorders. The guide will cover a wide range of topics of interest to families, and each chapter contains rich reference materials, including books, web sites, and names of organizations where additional information on each topic may be obtained. The Kentucky Family Guide for Autism Spectrum Disorders will assist parents from early diagnosis to young adult years and will be available at no cost on the KATC’s web site this summer. The goal of the KATC’s School-Based Team Consultations and Technical Assistance is to provide local educational teams with tools, strategies, and specialized skills needed to build a school environment that meets the unique learning needs of students with autism, and to promote a student’s access to the Core Curriculum. Rhonda Hedges, Principal of the Binet School in Jefferson County, joined the board of directors at KATC because of their involvement with her school. â€œWe had a particular case where we needed to bring in KATC’s support,â€ stated Hedges. â€œDr. Rick Hudson, who was working at KATC at the time, came to us to help with a very aggressive student in our school. He immediately told us everything we were doing rightâ€”not everything we did wrong. That positive feedback really helped re-energize our staff and boost morale,â€ said Hedges. Hedges stated that he and KATC staff members met with teachers, staff and families and gave them support they felt they never had before. The teamwork and training made a great difference in how they worked with the student in the classroom. The student now regularly attends classes and has gone from extremely aggressive to very calm. â€œYou wouldn’t believe the hours we would spend searching for dentists who take children with autism or program support information around the area for families. We can now send people to the online directory and it makes it so much easier for us and families who just aren’t sure where to turn when they need help for their child. It is amazing what a difference something like this makes for everyone who needs it,â€ said Hedges. Hedges emphasized the importance of teacher training and parental involvement with the schools. It is important to have on-going training and support because as a child ages his/her needs change. KATC provides a variety of training sessions and case study programs to meet the growing needs of families and schools around the state. Stacey Hinkebein, an elementary school teacher in Bardstown, KY, echoes Hedges’s statement about teacher training and KATC support. They also needed team training to learn how to create a learning environment for Lila, who has autism, and is a student in her kindergarten class. 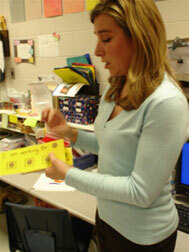 A KATC staff member worked with the educators and therapists to incorporate a visual-based communication system, and communication and behavior modification techniques so the child could be integrated into a regular school environment. â€œWe work with her parents as well so that we all stay on the same type of training schedule. Communication is always open between her parents and teachers. It is a big help to the child and to us when we keep each other aware of any changes in her behavior,â€ stated Hinkebein. â€œUsing a visual-based communication system and the visual schedule board greatly improved communication with Lila and we also spent time in her new school room during the summer, and met with her teacher, Stacy, and new aid Chrissy, so she could become familiar with a new routine,â€ stated Downs. â€œPerhaps the greatest accomplishment for Lila was potty training. 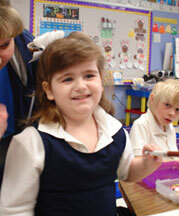 With the support of KATC, her teacher and aid, we managed to overcome one of Lila’s biggest obstacles,â€ said Downs. â€œIt has been a learning experience for everyoneâ€”including her classmates. We answered the children’s questions about her honestly and they have been very supportive and protective of her,â€ said Hinkebein. â€œKATC’s training and support will enable us to continually improve her program and progress in school and socially,â€ said Hinkebein. Dr. Lisa Kemmerer, a former faculty member at UofL’s College of Education and Human Development, specializes in the assessment and treatment of individuals with autism. She received a grant from the WHAS Crusade for Children for her project, Promoting Positive Behavior and Functional Communication for Children with Autism. Through the grant, she worked with Kim and Sean Johnson and their son Joshua to find home-based interventions that focused on functional communication. She also wanted to identify activities or situations that lead to Joshua’s aggressive behavior, and implement a program for the parents that would decrease the behavior over time. â€œWhen Dr. Kemmerer first came to our house, my husband and I were frustrated, exhausted and skeptical that she would be able to help us,â€ said Kim Johnson. â€œDr. Kemmerer assured us there would be no time limit on her working with us, because we were concerned we would need so much of her time. She continued to make weekly in-home visits until we had made great progress with Joshua and could effectively manage the new behavior program she created for us,â€ stated Johnson. Dr. Kemmerer’s assessment of Joshua’s aggressive behaviors showed they were triggered by multiple home situations. What she found most problematic for him was when his parents tried to talk to one another and their attention was briefly diverted from Joshua. â€œWe developed a functional communication training program that required Joshua to ask for his parent’s attention in an appropriate manner, to wait and take turns with his parents when playing a group game, and follow parental requests,â€ said Kemmerer. â€œWe also created a picture schedule that showed a sequence of activities Joshua needed to complete during the day that included rewards for appropriate behavior, (going to the park, watching a movie, having ice cream, etc. ),â€ stated Kemmerer. â€œPrior to the new program, I was completely mentally and physically drained by the end of the day. But today, our family life has been drastically improved and I can now go about typical activities just like any other parent. Joshua’s interaction with other children is also much more appropriate and he can now play side-by-side with them,â€ stated Johnson. â€œWe have also worked with his elementary school in implementing the behavior program and it has far exceeded our expectations,â€ said Johnson. â€œJoshua still has behavioral challenges but his improvement has been remarkable,â€ said Johnson. Autism is a complex developmental disability that typically appears during the first three years of life and is the result of a neurological disorder that affects the normal functioning of the brain, impacting development in the areas of social interaction and communication skills. Both children and adults with autism typically show difficulties in verbal and non-verbal communication, social interactions, and leisure or play activities. Research indicates that early identification is associated with dramatically better outcomes for individuals with autism. The earlier a child is diagnosed, the earlier the child can begin benefiting from one of the many specialized intervention approaches to treatment and education. Today, 1 in 150 children is diagnosed with autism. More than 27,000 Kentuckians could be affected by an autism spectrum disorder. Autism is more common than pediatric cancer, diabetes, and AIDS combined. Autism occurs in all racial, ethnic and social groups. Autism impairs a person’s ability to communicate and relate to others. Autism affects individuals uniquely, although individuals will exhibit any one of the characteristic behaviors in varying degrees throughout their lifetime. Autism does not result from poor parenting. With appropriate supports and services, people with autism can succeed in school, thrive in the workplace and contribute to their communities. Signs of Autism: The following “red flags” may indicate a child is at risk for atypical development, and is in need of an evaluation. No big smiles or other warm, joyful expressions by six months or thereafter. No back-and-forth sharing or sounds, smiles or other facial expressions by nine months or thereafter. Any loss of speech or babbling or social skills at any age. Repetitive behaviors such as obsessively arranging objects or following specific routines. If your baby shows any of these signs, please ask your pediatrician or family practitioner for an immediate evaluation. For more information about early identification and intervention, please visit http://www.firstsigns.org. KATC’s 9th Annual Autism Institute will be held June 5-7, 2008 at the Marriott Downtown, in Louisville. The institute will feature strategies and techniques to enhance the lives of those affected by autism. It is designed for special and general educators, related service providers, family members and mental health professionals who work or care for individuals with Autism Spectrum Disorders. Others interested in supporting persons affected by autism are encouraged to attend. For more information about the institute and to register, visit http://louisville.edu/education/kyautismtraining. The WCEC provides comprehensive multi-disciplinary evaluations that are based on referral concerns. Families are assisted in gaining a better understanding of the child’s developmental needs. Available professionals include: Developmental Pediatricians, Genetic Counselors, Psychologists, Speech Pathologists, Occupational Therapists and Social Workers. Coducts diagnostic evaluations of persons in whom “high functioning autism”, Asperger’s Disorder, or other social communication handicap is suspected but not proven. 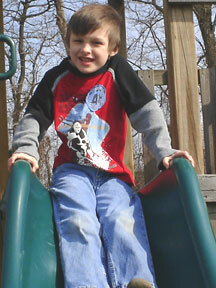 Uses the Autism Diagnostic Interview and Autism Diagnostic Observation Scales to solve “diagnostic dilemmas”. Available professionals: Pediatric Psychiatrist and Pediatric Nurse Practitioner. What Works Briefs: Summaries of Effective Practices for Supporting Children’s Social-Emotional Development and Preventing Challenging Behaviors. The Briefs describe practical strategies, provide references to more information about the practice, and include a one-page handout that highlights the major points of the Brief. The Teaching Tools are intended to assist teachers in problem-solving a plan to support young children who are having challenging behavior. The User’s Manual will explain how to use the tools and all of the technical information you will need to access the hyperlinked visual supports and materials. Also included within the Teaching Tools is the Routine Based Support Guide. The Guide is a document that accompanies all of the tools and is organized in routines and activities that typically occur in early childhood programs. It will assist teachers in support plan development. First Steps is a statewide early intervention system which provides services to children with developmental disabilities from birth to age 3 and their families. The program offers comprehensive services through coordination with a variety of community agencies and service disciplines. First Steps is administered by the Department for Public Health in the Cabinet for Health and Family Services.